Anybody who visits India from abroad knows these are not the best months to see India. We Indians know it all too well and you will see us flocking to hill stations in all parts of India; well most of us. If you are like me who dislikes too much crowd and high prices in peak season you are in all probabilities travelling now. Even though our country offers all kinds experiences and facilities for all pockets it does get a bit too easy to travel when its summers except for train bookings. INVEST in a sunscreen. If there’s something you don’t want that is over-tanning or sunburns no matter how pale you are. This becomes even more important if you like us prefer walking around the place rather than opt for private transport or even a public one. Buy a waterproof sunscreen especially if you are visiting beaches or there’s a chance you would get into the pool. Even if it is not extremely sunny or is even cloudy put up your sunscreen as long as its day sun is shining down. Do remember that you should put on sunscreen every few hours four works fine for me. Do not forget to wash your face or hands before you do it. you will feel refreshed with the wash and your kin will thank you later. A pair of shorts an tank top sounds really nice while travelling in the hot weather but it can result in a few problems especially in India. One you get a bit too much attention from people around second you end up tanning yourself a bit too much, especially lazy people like me who forget to apply or reapply sunscreen. Cover your face with a light cotton scarf or dupatta or a handkerchief. Apart from keeping the sun away you also do not collect dust and pollution on your face. This is especially true when you are riding a bike or a two wheeler. Wearing light cotton clothes which also cover your arms will really help in keeping you cool. I am still on lookout for some nice linen pants to help me keep cool. This might be a personal thing but I prefer wearing flipflops and my toes do get a bit burned. Aj prefers shoes as they avoid direct sun on his feet and he is a happy guy. I do have to concede that with a lot of walking shoes might be a better choice. Maybe I need to add a pair of loafers in my shopping list. This I guess is something I don’t need to even say but just to say I covered it all here it is. Get a good pair of glasses. If you already wear glasses for eyesight correction buy a photocromatic set to help you reap maximum benefits. Summers can get really dusty too and it is always good to shield your eyes from sun, wind and dust. Now moving away from what you can put on let’s get in to the real well being in winters. Best thing to do drink a lot of water even if you take all the precaution you would not be able to avoid sweating and if you are travelling in south humidity is going to add to the amount you sweat. Always carry your own bottle of water bottled or tap water- your choice. Don’t think you would find water when you get there take it with you, in most cases it will be over before you reach your destination or complete a tour. Also in tourist areas the nearer you get to attraction water gets more expensive so carrying a bottle would help double fold. Fill up your bottle wherever you can look around for clean dispensers. Most of the monuments and sites have some facility of the sort. Last words of caution drink enough don’t overdo it you might not find clean loos everywhere. While water can be a saviour on hot days do remember drinking a lot of water, sweating and peeing will lead to sodium levels in your body drop. Runners know this far too well and supplement with salt caps on long runs. For people like me who suffer from Hypoglycaemia it is a warning sign if your sugar levels drop. Walking with sun burning above your head it can get low very fast. Easiest thing to do is to lookout for somebody selling coconut water or sugarcane juice around you. There should be a few shops around prominent sites anyways. 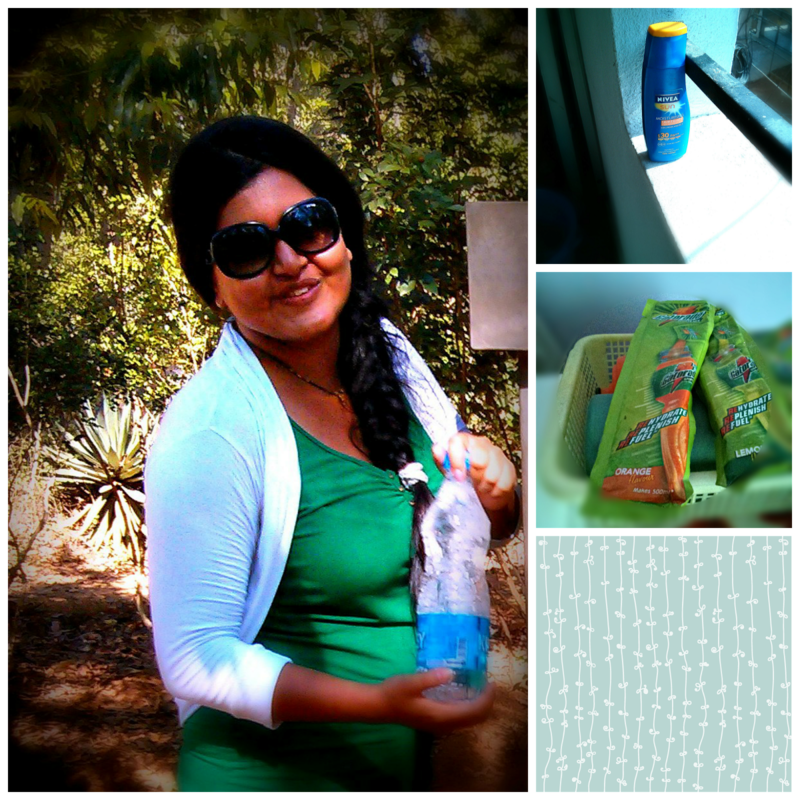 On our last trip to Mahabalipuram and Pondicherry we found the benefits of Gatorade. I am not a big fan of their drinks but the powders are quite handy and make you feel energised with a few sips. I prefer the orange flavour and it was what kept all three of us walking in the heat. I used to keep rasna pouches with me earlier but I found the drink better this time. Try electoral or something similar. Well all said and done when you travel you learn more about what you can manage and what works for you. With my updated shopping list I am looking forward to my Hampi trip in June.